Over 25 years ago a nurse by the name of Beverly Chappel was working on a pediatric oncology unit in Portland, Oregon. In her care was a little boy, Dougy. She became aware of how much time Dougy spent with the other kids talking about death, dying and comforting them. She began to conceive the idea that maybe kids could help other kids through the grieving process. Beverly’s husband was a prominent pediatrician. He arranged meetings for her with other physicians, heads of hospitals, and medical personnel. Her reception was abrupt. She received only one slightly positive comment, which was “I don’t think it will work, but if it does, call me back”. The field of grief – thanatology – was still young then. It was widely believed at the time that children did not have the developmental capacity to grieve. So Bev started the first children’s bereavement support group – on her own – in the basement of her home. Today, The Dougy Center is a national organization serving children in Portland and all over the world. Around the world, 148 centers have been trained by The Dougy Center Staff. In 1998, Carrie Kenyon, Family and Children’s Services Coordinator at Lewis-Clark Early Childhood Program, heard about The Dougy Center. As a teacher, she had noticed that year after year, a child in her classroom experienced the death of a parent or sibling. She was troubled by the lack of services for these children and became determined to do something about it. Carrie contacted the Dougy Center and arranged for them to present a 2 day workshop. The first day focused on children and grief while the second focused on the process to start a bereavement support group. From that workshop, a handful of people came together and formed a steering committee. After working together for about a year the group was ready to present the idea to the community. As a result, a board of directors was formed, volunteers were solicited and Willow Center, Inc. was born. With the groundwork laid, in January of 2000 the program opened to start the first children’s bereavement support group in the region. The plan to begin with one group quickly changed to two when 11 children of various ages signed up for services plus a group for parents/guardians. In the second year of operation the participants doubled in size. This was a clear indication that the services provided by Willow Center were much needed in the Lewis-Clark Valley and surrounding areas. Willow Center continues to serve children, teens and their families today. There are currently four different groups; A preschool group (ages 3 – 5), a children’s group (age 6 – 9), a middle groups (age 9 – 13) and a teen group (14-18). A group is also held for parents and guardians. Group meetings are the first and third Tuesday of each month from 7 – 8:15 pm. In 2005, the fifth year anniversary of Willow Center, board chairperson, Lisa Manyon, together with board members, facilitators and clinical coordinators, initiated application as a Twin County United Way partner agency. The application was unanimously accepted. Exposure and support from this valuable partnership has given Willow Center for Grieving Children access to funding and awareness to help build a solid foundation for the future. With the help of Twin County United Way, we hired our first paid staff member. Dee Dee Arnzen joined Willow Center in December 2006 as our Executive Director. Debbie McCulley served as the Executive Director from June, 2007 – June of 2009; Judy Rooney served as the Executive Director from June 2009 – October 2014. Kristin Schmidt served as director through December 2016. Joni Drake is the current Executive Director. In January of 2010 we celebrated our 10 year anniversary: Willow Center… a decade of healing and hope. 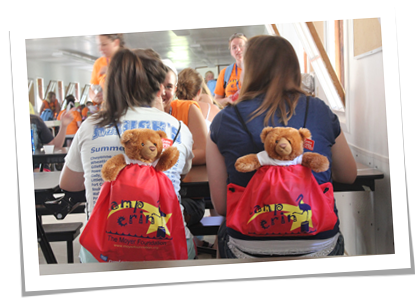 Along with this milestone we also began our partnership with The Moyer Foundation to begin a ten year commitment to host Camp Erin, a weekend, overnight bereavement camp for kids ages 6 – 17, who have experienced the death of a loved one. This same year we also begin a partnership with A Little HOPE Foundation, from New York, who has funded a project for high school grief groups, and most recently the expansion of the Willow Center program to the Palouse. As the program continues to grow the board is working diligently to gain more funding that will help provide continued training for the volunteers, resource materials for participants, additional paid staff and hopefully one day, a home to call our own.